Stoneware, incised, 0.4L, pewter lid. 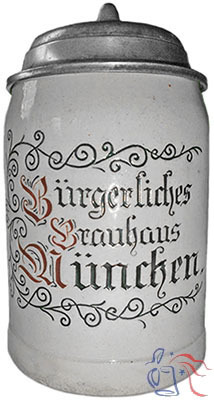 Bürgerliches Brauhaus München, a public corporation, was created from the family-owned Zenger Brewery in 1880. 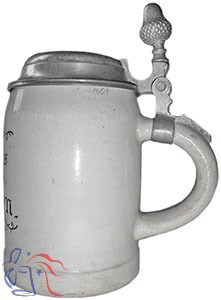 It survived until 1921, at which time its assets were absorbed by Löwenbräu AG. Interestingly, one of those assets, a large beer hall called the Bürgerbräukeller, was to gain international fame just two years later as the location of the infamous “Beer Hall Putsch” (coup), a failed attempt by Adolf Hitler to seize political power in Bavaria.